I love these crystals. I want to win! I use Purex and would love to try the new crystals.Thanks. Send me a free bottle!! entered to win a bottle of Purex Crystals. Hope I win Karen. I love this stuff. It makes everything smell great!!!! Im wondering how this smells? This is great! The smell stays on your clothes for a long time! I love to try new products. Free is even better. these r wonderful make urclothes smell awesome!!! Always like to try something new! Purex is and always will be the best for the money. Just as good if not better than those outrageously higher priced detergents out there. Thanks Purex for looking out for those of us who are cost conscience about our budgets in this wonderful economy. i love this stuff…its great!!! Purex is a greatproduct. I use it all the time. 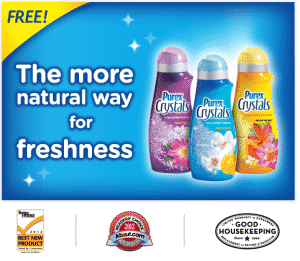 I’ve heard that Purex Crystals is GREAT–I would LOVE to try it!!!! I use Purex anyway, would love to try these crystals. i’ve heard of it but never used it yet but my friend says it smells great..
Hi Good Morning . This is Danette. I Love Purex Dish Soap Sign Danette. Im trying to get free coupons ? With many children and the economy the way it is. any helpfrom a company willing to give u a sample of something is a great BIG HELP!!!!!! some of the best smelling stuff out there, actucally prefer over other brands!!!! i use purex all all the time and affordable..
Would love to try these, I already use Purex Tabs, they work great! Gosh I love these crystals.. they are the best smelling and makes my clothes sooo soft.. Sure would love to win.. won’t do laundry without them… thanks for the chance to win..
Would love to try the Crystals. My mom use Purex back in the day.